In the morning, one of the first things I do when I am away from the country, is to switch on the news channel (BBC & CNN preferred but if there is none, then the local news channel). It has been my habit since I started flying overseas for assignments. You will never know what would be the breaking news for the day. That is how one day back in 2004 when I was in Ghana, I woke up to a beautiful morning and switched on to the BBC news channel and watched the tsunami that killed almost 280,000 people. I recalled my wife saying that they were going to the beach. I panicked and desperately tried called the numbers that I knew but no one answered. It was a good 30 minutes before my wife picked up and noticed the 20-25 miss calls. They were at the beach with my Big Boss (who was a few months old) and had not known what had happened on the other side of the world. They went back to the hotel room and were glued to the TV for the rest of the day. I still maintain this habit and one thing about watching the news on Malaysia overseas is that there is less propaganda and biased reporting (honest, it seems to be so). When it comes to calling a spade a spade, you get the raw deal. Yes, you still see Najib on the news but the foreign news channels do not waste the opportunity when the administration bungled big time (not like in Malaysia where such delicate matters are swiftly swept under the carpet or the respective Ministers coming out in public and making dumb statements). KUALA KANGSAR: Sultan Nazrin Muizzuddin Shah, chairing his first meeting of the Perak Dewan Negara since ascending the throne, told its members to always tell him the truth “no matter how bitter it may be”. “Do not tell me tales to send me into dreamland when the reality on the ground is something entirely different. “Hopefully, members of Dewan Negara will help me in all sincerity and honesty so that I can discharge my responsibilities fairly and equitably,” he said in addressing the 159th meeting of the Perak Dewan Negara at Istana Iskandariah here yesterday. 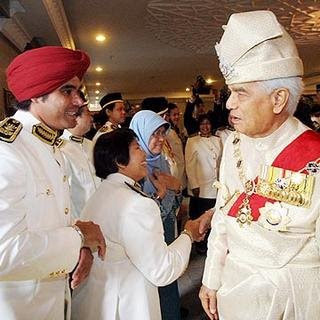 Sultan Nazrin recalled that his late father, Sultan Azlan Shah, when addressing the 150th meeting of the Dewan Negara in March 2012, had said that the institution of the monarchy would remain relevant so long as it had the respect of the people. In an ideal situation, in an ideal country, this would have admirable but it is not. This is Malaysia and of all places, this is Perak where in 2009 BN politicians staged a coup (sort of) with 3 assemblymen frog-jumping to the dark side of the force and took control of the state in the most undemocratic way. And now 6 years down the line, the new Sultan addresses the assembly and asking the politicians (the very same ones who were involved in the power tussle in 2009) to tell him the truth no matter how bitter it is. The good Sultan’s intentions may be noble but this call is a mere wish list. It is not going to happen – not now, tomorrow or ever. Which politician have been angel and been the one who tells the truth, nothing but the truth? There are a couple of them out there but you not going to find it in the Perak assembly where even pepper spray was even used. And because, most of the time, the trouble makers are the politicians themselves. The last thing they want to do is to point the finger at themselves. Even in the net, some even questioning why the Sultan is asking the politicians for the truth? Doesn’t he has other alternative sources? Doesn’t he had aides who can go and check around on the issues in the his State? Doesn’t he has the power to call up people who are involved and ask them directly? Does he has any powers to punish or make things right? And speaking of living in a dreamland, there is one clear winner in this country. You also know who is the person. And this is one reason why this country going down the drain. It does not take an Einstein to know that you are in dreamland. Just look at the front pages – child custody issue and the police confused which law to follow, Malaysians getting famous for the reasons as fighters in other countries, racial and religious slurs and accusations is flying all over the place and at a rate of free for all. And where the guy in dreamland doing? Busy flying around the world and closing one eye to all these issues. In other words, no where to be seen. That’s right – no where to be seen. And I am not talking of him not being in the country (well, lately he has been doing just that). What I mean is he is not in the thick of the situation. Child custody issue – both parents gets involved, both courts gets involved, the police gets involved and then get confused and both side politicians gets involved and ask the Government to step in and makes things clear. The man in charge is no where to be seen. He is still in the dreamland where the country is doing well and the citizens living happily ever after. This incident Saturday morning where a skinned cow’s head was found in front of R.S.N Rayer’s house in Penang is a result of the Seri Delima assemblyman’s big mouth, said Home Minister Datuk Seri Dr Ahmad Zahid Hamidi. Dr Ahmad Zahid said this was the price Rayer had to pay for being a “mulut celupar” (lose cannon). ‎”As a politician, I sympathise with what he has to go through in the incident. But that is the price he has to pay if ‘mulut celupar’,” he told reporters after launching the Certified Security Guards training programme here Saturday. As a politician, he sympathises but as a Home Minister, shouldn’t he be doing something? Or is he like his big boss, still in a dreamland where ministerial job is taken as something exclusive and opened to the selected few and failure to discharge their duties rightfully, unbiased and with greater responsibility & care means nothing? Nah, this too is not going to happen and you know why? The big guy is sleeping on the job and still in a dreamland. No one knows who is on the pilot’s seat. Will he wake up and come out and smell how the real world smells like? GE13 polling has officially ended but not the subsequent implications. It will take probably weeks and even months before things get settled down. Anwar have indicated that Pakatan will not accept the outcome of the elections until EC explains on some of the glaring irregularities – they just had a large public rally on this which in turned caused a massive traffic jam (Raja Petra however raised concern of something more sinister) and surely there will be legal suits flying around. And there are quite number of states and seats won on slim margin – so one needs to wonder if there will be another round of frogs jumping ships as what we saw back in 2008? And trouble is brewing in Selangor as to who will get the Menteri Besar seat – I just hope the PKR fellows do not screw things up big time – pro-BN bloggers already having a field day on this. All in all, it is a good election for Pakatan Rakyat. Racial bigots of Ibrahim Ali and Zulkfli Noordin were promptly shown the exit by multi racial voters but rest assured they will be around to cause the usual trouble. Nurul Izzah won the closely contested Lembah Pantai seat and a big thanks to the extra vigilant supporters, had managed to ensure the fight was fair and square and won it accordingly. Dr M got a good slap when Lim Kit Siang won the Gelang Patah seat with a good majority of 14,000 plus votes – still remember this old-man asking people to bury Lim Kit Siang in Gelang Patah and then recklessly said that there will be racial confrontation if Lim wins? Thankfully the voters thought otherwise and handed Uncle Lim a good margin to win. On a bigger scale, despite failing to capture Putrajaya (which many of us were hoping for), Pakatan improved their number of seats in both parliamentary and state level. They kept Penang and Selangor with a higher majority and came close to regaining Perak and Terengganu. The popular votes also went to Pakatan – with 51% of the votes going to them (BN got 47% of the votes). The Kedah was a different story altogether – the votes in Kedah shifted to BN in a big way not because BN was better than Pakatan but rather it was because PAS screwed things up after they won it in 2008. Still remember them going over the board with their extreme Islamic way of governance even on non Muslims? We would have been dumb to still think that PAS would be able to keep Kedah. Its fall was predicted from day 1 and it did. Terengganu was a 50-50 thing. At this juncture, Vasantha Kumar said, “Saravanan threw a chair at me while I was being pushed out.” “I was shocked when the police manhandled me, pushing me 50m out of the centre, while Saravanan and his assistant tried to attack me. However, the police stopped them.” Vasantha Kumar claimed that he and his counting agents were pushed out by the police all the way to the main road outside the hall. It was also disappointing to note that a number of spilt votes screwed up some of the seats for Pakatan. Independents (all whom been wiped out for good reasons) screwed up the chance for Pakatan in Cameron Highlands big time – MIC’s G Palanivel got more votes against him and yet he won with slim margin, no thanks to almost 1,200 votes going to independents. The Pakatan’s screw up in Kota Damansara and Semenyih however is not excusable. Two good state seats were lost because of the stupid in-fighting within Pakatan for the same seats. Thankfully Pakatan had garnered enough seats to form the State Government otherwise Pakatan fellows would have kicked themselves for the major screw-up. Hopefully this would be the last time Pakatan make a fool of themselves and have overlapping claim for the same seat. Every win counts (especially in situation like in Perak now) and the last thing they need to give away the seat on a platter with split votes. That would be really dumb. No one asked you to give free dinners, RM500, lucky draw, etc. You syok sendiri. The Chinese did not cheat you. But I must congratulate the Penangites. They had two weeks of free food (no need to cook), a lot of free entertainment, money, and 2 weeks later, they get a good government in place! You have got the best of both world! He also failed to wrestle back Selangor despite leading the BN’s well oiled election machinery and with defeat of some of the BN Chairman in other states which included Malacca, Penang and Johore, the Fat Momma’s expensive overseas trip in coming months may be short lived. And the consequences would have been worse for him in the coming months if the allegations of phantom voters and other irregularities are proven to be true. At the end of the day, it has nothing to do with the Chinese, Malay or even the Indian tsunami. Yes the number of Chinese turning up and voting for Pakatan was higher than before. Are you going to blame them for that? Where it says that the Chinese (or any Malaysians for argument sake) have to vote for BN only? What a bunch of sore losers! It’s a fact that Pakatan could not have gained more votes using Chinese votes alone. PAS has expressed gratitude to Chinese voters who backed Malay Pakatan Rakyat candidates in the recently concluded general election, even if it meant having to vote against a fellow Chinese. PAS information chief Tuan Ibrahim Tuan Man said the action of these voters proved the claim by Umno that the Chinese had rejected the Malays to be slander. “There are tens of Parliament and state assembly seats that were contested by Malay candidates against candidates from the Tiong Hua (Chinese), in mixed constituencies, which were won by the Malays, proving that Chinese voters were willing to reject candidates of their own race,” Tuan Ibrahim said in a statement today. Well, to those who keeping harping on the Chinese tsunami and how the Malays will be left out in the country, it is not about the race, and here’s why. It’s a fact that Najib did miserably when it comes to fighting corruption and national unity. He did nothing on instances of sheer corruption just because those implicated were from his own political party and he needed them for his own political survival. It took two independent journalists to break the story on PKFZ, a young politician from Pakatan to prove the abuse of taxpayers money dubbed “The Cowgate” (Najib even did not have the balls to sack the Minister) and some foreigners going undercover to show that there indeed a shadow state in the country. Despite the urgency and the need for an independent and robust corruption busting agency, Najib did nothing to strengthen the MACC – it remained lame duck. He promised to do something about it but that promise came with a condition that BN must win the election. Now he had won, will Najib keep up his promise? On the national unity, it seemed a joke for Najib to call for national reconciliation. By blaming the Chinese for his own losses, he had started his administration by pitting the Chinese against the Malays. The king-makers Indians who were the darling of politicians before the election are now nowhere to be seen. Tough luck for Hindraf and their MOU with Najib – let’s see how sincere Najib will be now that he blaming it on the Chinese. He started the notion of 1Malaysia which seemed to be a good thing as we head towards the year 2020 but did nothing to curtail racial statements from his own party controlled mainstream medias and the UMNO friendly Perkasa extremists who even at one point threatened to burn Bibles. Where was the tough action back then? Najib justify the remarks in Utusan by saying that the Chinese media does the same. Once again, where the tough action against the Chinese papers if they been doing the same? Is this how a Prime Minister of a multi-racial country speaks when it comes to curtailing racial incitements? At end of the day, there must be a proper closure – both to the acceptance on the outcome of the GE13 and incorrect blame of the losses on the fellow Malaysian Chinese. Yes we must protest against unfair election process and bring forward any irregularities to be rectified but then again, we should go on with our life – after all, there is a government to be run here. It is almost sure every political party (in addition to the various blogs, political analyst, media, etc) out there would be making their own assessment on the outcome of the elections, see where they have made mistakes and how they can improve on it for the greater benefit of the people and country (not for themselves and the political party). Pakatan must improve their standing in the next general elections if we want to see a real change at federal level and hence improvement in competency, accountability and transparency. Unlike some politicians from the other side, Pakatan politicians need to ensure that their service centre are still operating and still providing the best service especially in areas where they had lost. Losing does not mean doing nothing and blaming others. Losing means an opportunity to improve on their standard of service and engage the people on the real issues facing them. The sooner the politicians do this, the sooner the country can get back on its feet. I really wonder whether we will ever cross the finishing line to be a developed country if highly political and seditious matters are played on public grounds on regular basis, turning one Malaysian against another based on hearsays, political hidden agendas and highly charged emotions. It used to be the crosses on some cookies or the logo on a famed football club or “Christian” names on some schools. Frankly, I do not know which of this is more serious – a sickening criminal who been going around splashing acid on innocent people whom victims included young students and a year old baby OR the rumors that has been going on that there are certain people in this country wanting to make Christianity as the official religion of this country. In the case of the acid splasher, the frightening thing of the matter has been this – about 20 people has been splashed with acid todate (one with severe burns that almost blinded her left eye) but the police yet to gain any lead to catch this maniac. Unfortunately the attention of the nation as at now seems to be lying on the other case of stupidity in the horizon. It is rather reckless of the mainstream media to have published this news which even if it is true in one’s wildest imagination, should have been left to the police to investigate and prosecute. There is a danger that whoever reads the unsubstantiated story in the newspaper may construe it wrongly and may make decisions based on emotions rather than informed facts. Still remember the 9 churches which were burned down last year over the “Allah” fiasco? Despite having a court order granting the use of the word “Allah” and that too after 2 years legal due process, Malaysia ended seeing the uglier side of religion extremists. After all, no one in their right mind and with strong religion convictions would burn down another’s place of religion. The parties involved have denied the allegations and even called the reporting as “playing dangerous politics”. Now both sides have made police report and the police will soon have to use it’s already stretched resources to investigate this – valuable resources that could have been better utilized to do other things such as catch the acid splasher. But what happens if the police have investigated and that the claim by the newspaper is not true. Then what happens – will the blogger and the newspaper who published the allegations be made responsible for their actions? Let’s trace back to 2006 where there was allegations via SMS in the State of Perak that 600 Muslim students is going to be converted into Christianity – apparently started by the Mufti of Perak himself based on hearsays. No doubt, pandemonium broke out and the church was soon surrounded by angry Muslim protestors. Thankfully the police was at hand to keep things in control and in the end, the SMS was found to be untrue. The Mufti disclaimed responsibility by saying he relied on someone else for the source of the allegations and he did not really investigated the truthfulness of the allegations but continued to spread the news to others. Read further here. There seems to be a similar chain of events here – allegations made and picked up by someone who deemed to have some sense of responsibility (in this case, Government controlled mainstream media). But the question that arises – can Christianity really be made as the national religion as claimed by the newspaper? Is it really that easy to change the constitution? Can the Christians gain enough seats in the Parliament to even have the votes to make the change? The truth of the matter is it will not happen – not now and certainly not in the near future. Islam will remain the national religion of Malaysia and everyone including the Christians has acknowledged this. Renowned constitutional expert Abdul Aziz Bari has dismissed Utusan Malaysia’s article on a supposed conspiracy to make Christianity Malaysia’s official religion as “ridiculous”. “Constitutionally it is just illogical. It cannot happen, just impossible. Even if Pakatan controlled hundred percent of the Dewan Rakyat. He argued that technically the upper house can block the amendment passed by the Dewan Rakyat. Abdul Aziz contended that the provisions on the subject matters – monarchy, Islam and the Malays – are simply beyond the ordinary political process. So, even if there were calls for change of the national religion and to have a Christian PM as purported by the newspaper – it is not going to happen for a fact. Christians simply do not have the numbers to make it happen (remember there is still the Buddhists, Hindus and others that they need to content with). So, why the big concern of this in the newspaper and in the blogsphere? Why now? At this juncture, I have to agree with the former PM’s contention that the current Federal Government has gone weak. But I disagree that the Government is weak due to not having the two-third majority. It is certainly not. It is weak because it failed to act on both ends – act against accusers who spread lies and allegations and act fast against the accused and investigate the truthfulness of the allegations. It has become a Government who put their foot down for the wrong reasons. Certainly somewhere in our journey after gaining our independence 54 years ago, we have gotten our priorities wrong. No wonder we still have a maniac with acid on the loose. I pray that sanity will soon return to our “Bolehland” in the next few days. Islam Under Attack? What about Christians? Perak Pakatan Rakyat is prepared to challenge the Road Transport Department (RTD) in court if vehicle owners are prevented from renewing their road tax after being blacklisted by the police for not settling speeding tickets from 2000 to 2009. I wonder who came up with this brilliant idea – must have been another idiot with a lot of outstanding summons. There are certain things you can do to get votes for the next elections but there is always a limit. And one of it is that you don’t go all out to protect the criminals, in this case, stubborn road offenders, just to get some votes. That is wrong and certainly is not popular with the rest of us. Instead wanting to bring the issue to the court and end up looking like a fool, the Perak Pakatan Rakyat should ask these buggers who been blacklisted, what offence they have committed and have they paid up the long outstanding summons. These buggers should not be let off free from the offence that they have committed. They should be made to pay what is due. Who asked them to sleep on the outstanding summons for so long? Who asked them to commit an traffic offence in the first place? I just hope that Perak PR will find the wisdom to realise that what they are proposing now is nothing short of being foolhardy, stupid and simply ridiculous. Otherwise, it will be a blessing in disguise for Perak to be taken over by BN who is doing a better job in trying to book down these road offenders. We don’t protect the criminals and certainly we will not waste time fighting out for them in the courts. Let them pay their due as prescribed by the law. Hopefully they will be less menace to others on the road. Perak DAP chairman Datuk Ngeh Koo Ham said all DAP elected representatives in the state were required to sign such an agreement after the general election in March 2008. “Yit Foong and Keshvinder signed an agreement with the party when they became candidates, that they will quit their posts (as assemblymen) if they join another party or leave the DAP and will pay a compensation of RM5mil to the party,” he told reporters at the Parliament lobby. I don’t know what you think about this but this latest action by the Perak DAP certainly leading to nowhere. When Hee, the infamous “frog” decided to quit the party, it created nothing but chaos in the Perak state administration for months. DAP certainly made a lot of “noise” about this but at the end of the day, there was nothing they could do. Hee became pro-BN “independent” and went under the radar in her constituency. At this point there was no mention of this illusive contract or the penalty of RM5 million. But when another DAP assemblyman decided to quit as well, all the sudden DAP is busy with contracts and penalty of RM5 million. Why now and not when Hee made the jump last year? Can Perak DAP really enforce a contract that is made after the last general elections? Can these “frogs” argue the defence of duress? Plausible. Or perhaps the frogs were too happy with the unexpected win and were just too eager to reap the “benefits” that they blindly signed on the dotted line? Going to the court with the so-agreements is not the right way for DAP’s image (more importantly image of Pakatan Rakyat). It is not going to stick – and it is only going to waste the court’s (and DAP’s) time and resources. And if DAP somehow manages to get judgement in it’s favour, that is not the end of the road yet – the frogs (backed by BN since they are pro-BN) will only appeal to higher court. DAP is going to lose plenty of months walking in and out of the court, wasting money and time and in the end, may end up with empty hands. But instead, here is what Perak DAP should do. Forget about this agreement nonsense – it is a waste of time and resources. If they really want to enforce people from becoming frogs in future, nothing can be done unless they can get hold of the majority in the Parliament and come up with anti-hopping laws. That is the better way to do things. In the meantime, DAP should open up a service centre in the Singh’s constituency and give the best service that the people there deserves to get. Show the people that the lack of money does not mean lack of good service. Show the people that no matter what is the situation that may be facing Pakatan Rakyat in the state of Perak, they are still the Government elected by the people and just because their controls on the State Government was denied by dubious ways, they are still working in the best interest of the people. Do that and Perakians will not have doubts as to who they need to pick when the next elections comes around. Don’t waste time and resources and make a fool of yourself by trying to go after the politicians who jumped in the courts. We can do better than that. I really don’t see how this recent clown show is going to help the Perakians in the long run. DAP’s Perak state representative for Malim Nawar, Keshwinder Singh, announced Tuesday that he has quit his party to become a Barisan-friendly independent. He also declared support for Perak Mentri Besar Datuk Seri Zambry Kadir, saying that he was impressed with his leadership in the last 15 months after Barisan Nasional took over Perak from Pakatan Rakyat. He also said he was leaving because he was “very disappointed” with the DAP and Pakatan Rakyat leadership and the “excessive politicking” that got in the way of him carrying out his duties. “I found it very hard to work with the Pakatan Rakyat people to serve my constituents,” he said, adding that he could not get any allocation for his constituents. Not happy with the leadership and have lack of funds has been the usual excuse for politicians to jump ship whilst trying to justify that the action was done in the best interest of the people. Such excuse is very lame and certainly we don’t buy it such bullshits any more. There will always be some dissatisfaction with the leadership from time to time (just ask the MIC fellows who got kicked out by their President recently) but what is needed is more discussion and a determination to resolve all issues. There must be a need to go through the proper channels rather than painting ugly picture in the public media. A solution must be found in the best interest of Pakatan Rakyat and for the people who voted them into power. So, if one is saying that he quit because he is not happy at those people at the top – then the question would be – has he addressed them in a better way before calling it a quit? Having no money for the constituents is another excuse – ex PKR’s Tan Tee Beng used the same excuse, remember? If Pakatan Rakyat was still helming the State Government, I am pretty sure this fellow would not have quit his party for there would have been fair allocation of funds from the PR led state. But when BN took over the State Government, one can only expect that it will be only a matter of time before the source of funds to the Pakatan Rakyat state assemblymen to be squeezed to the maximum. After all, practising double standards when it comes to allocation of public funds under BN is nothing new. I am pretty sure that the same situation that this fellow faced – i.e. no money to serve the constituents – is also faced by other Pakatan Rakyat politicians in all BN led states. But why then we don’t see massive resignation of the politicians from Pakatan Rakyat and ending up as BN friendly independent traitors politicians? Perhaps they have better integrity and understanding of the constituents’ sentiments? Perhaps they are better at fund raising and creative allocation of whatever money that they have so that their constituents can be continued to be served proudly despite the lack of allocation from the state? Perhaps they are just biting the bullet and endeavouring the hardship so that they can give the best for the people? Good service not necessarily means throwing millions of ringgit on the constituent. Where there is a clear lack of money, plenty of things can be done with good character, integrity and a good sense of creativity. One got Datukship but for what (other than for a great “jumping” skills), only ET knows. Two got their charges dropped, well no big surprise there. When they were still under Pakatan Rakyat, there were already rumours that the charges were trumped up to add the pressure on these two to resign. Now it looks like it was so. 3 got their rewards, the voters got screwed and a state went into chaos.